Clerics in Parliament: In 1980, clerics held 61 percent of seats in parliament. In 2016, only 6 percent of parliament were clerics. Women in Parliament: In 1980, 4 women were elected to parliament. In 2016, the most recent election, 17 women won parliamentary seats. For the first time, females outnumbered clerics. Candidate Registration: In 1980, 3,694 people registered to run for parliament. The number of candidates was more than halved in 1984. In 2016, a record 12,123 ran for office. 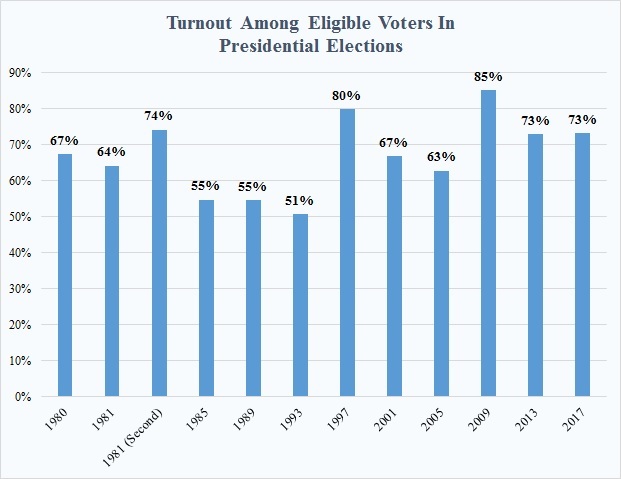 Political participation is up. More than 12,000 Iranians registered to run in the most recent election in 2016. Women, in particular, signed up in large numbers—a total of 1,434. Both set a new record. But in Iran, all candidates are vetted by the Guardian Council, and the majority, usually, are disqualified. The numbers, however, indicate public interest in running for office. 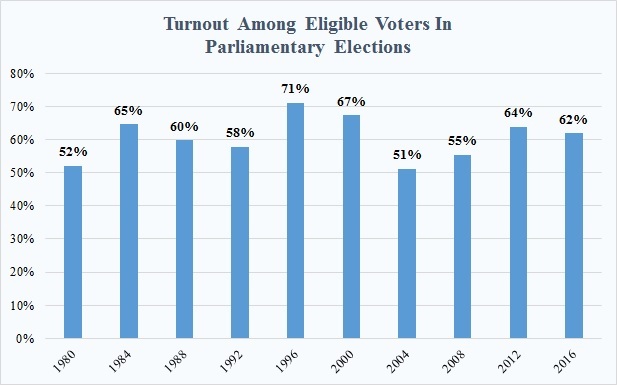 The turnout in presidential elections has often been higher than that of parliamentary elections. They are held in separate years. Some 85 percent of eligible voters participated in the disputed 2009 presidential election, which was won by President Mahmoud Ahmadinejad and led to the Green Movement uprising. Despite doubts about the results of that poll, the turnout was 73 percent in both the 2013 and 2017 elections won by President Hassan Rouhani. This article is based on research done by Katayoun Kishi, who was a research assistant at the U.S. Institute of Peace in 2016.